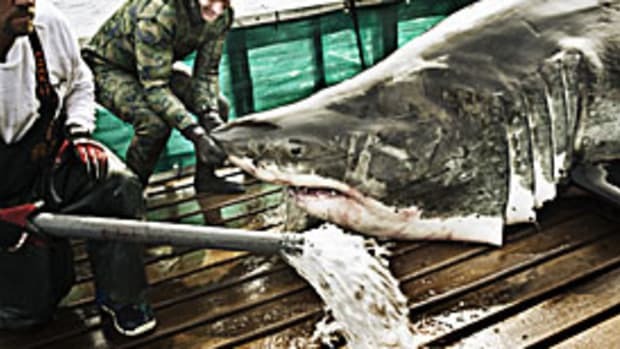 Two commercial fishermen in Mexico received the surprise of a lifetime Sunday when they hauled up a great white shark measuring nearly 20 feet and weighing about 2,000 pounds, according to local news reports. The rare catch of such a large white shark — at 20 feet it&apos;d be among the longest ever recorded — was made in Mexico&apos;s Sea of Cortez near Guaymas, by fishermen who thought they had merely scored a large haul of much smaller fish as they hoisted up their net. "We were amazed and immediately realized that we had a huge, dead, great white shark and then we thought what are we going to do?," Guadalupe, one of the fishermen, told a local sportfishing magazine.